Uses : Carica papaya contains an enzyme known as papain, present in the fruit, stem and leaves.The milky juice is extracted, dried and used as chewing gum, medicine (digestion problems), toothpaste and meat tenderizers. 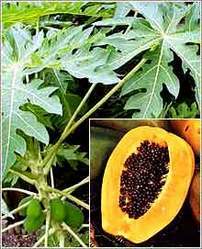 Meat can be tenderized by wrapping it in a bruised papaya leaf before it is cooked.Carica papaya contains many biologically active compounds. Two important compounds are chymopapain and papain, which are supposed to aid in digestion. Papain also is used to treat arthritis. The level of the compounds vary in the fruit, latex, leaves, and roots. Papaya has been used for digestive problems and intestinal worms.The softening and disintegrating qualities of papain (generally in alkaline combination, as with borax or potassium carbonate), have been taken advantage of in the treatment of warts, corns, sinuses, and chronic forms of scaly eczema, cutaneous tubercles, and other hardness of the skin, produced by irritation, etc., and injected into indolent glandular tumors to promote their absorption. Green fruits are used to treat high blood pressure and also used as an . It is useful in round worm infestation, stomachalgia, dyspepsia, constipation, amenorrhoea, skin diseases and general debility.